It is said that a sapper from the Ordnance Survey fell to his death here during survey work on the first 6 map series in the 1830s. Binn an tSaighdiúra is the 191st highest place in Ireland. Binn an tSaighdiúra is about 15 mins from Bencorrbeg, and we tackled it second on a Bencorrbeg - Binn an tSaighdiúra -Binn Corr horseshoe. Unfortunately the clouds had descended by the time we hit the summit, so the famed views weren't visible. 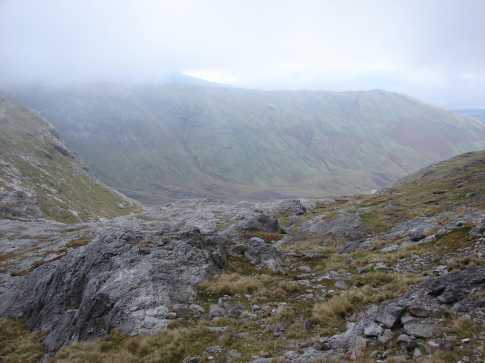 Instead, I'll comment on using Mám na bhFonsaí as an escape/exit from the Gleninagh horseshoe.